In Volcanic Air’s 206B JetRanger, it’s a relatively quick 20-minute flight from the shores of Lake Rotorua to the interior of New Zealand’s only active marine volcano: White Island. On the way, your pilot tells you about the local Maori people (the lake’s name means “lake two” in Maori), the Kaingaroa Forest (the largest human-planted forest in the world with more than 1100 sq miles of Monterey pines), and Captain James Cook’s naming of the island after either seeing steam rising from volcanic vents or the island’s supposed resemblance to a white whale. White Island pokes up out of the surrounding Bay of Plenty and spews sulfur-laden steam from vents inside and outside its crater. Descending into the volcano’s edge and landing on a wood platform just a few feet wider than the JetRanger’s skid tubes at the edge of the volcano is nearly as exciting as subsequently hiking to the crater’s edge and peering down and across at about a dozen spewing vents, imagining the volcanic activity occurring inside the mountain. The breeze often carries just a whiff of sulfur odor, although filtration masks handed out by the Volcanic Air crew provide relief if the wind shifts. Founded in 1992, Volcanic Air uses a mixed fleet of aircraft to conduct sightseeing flights from its base in Rotorua on the North Island. In addition to the sole JetRanger in its fleet (outfitted with VHA main and tail rotor blades), Volcanic Air operates Airbus H120 and 125 rotorcraft and Cessna 206 and Otter floatplanes. 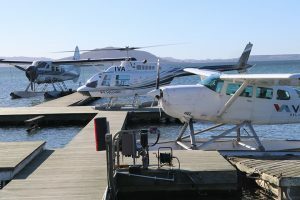 Passengers board the helicopters or floatplanes from Volcanic Air’s lakefront dock; at the end of the day the aircraft depart the dock for hangaring at nearby Rotorua International Airport. 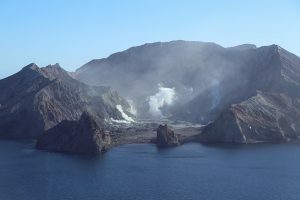 Besides being one of only a handful of tour operators with permission to land on White Island, Volcanic Air also conducts sightseeing and charter tours of geothermal hotspots in the region with names like Hells Gate and Buried Village. Other air safari packages include wine tasting in the nearby Hawke’s Bay region, golf excursions, guided back country fishing, and a glow worm cave tour. 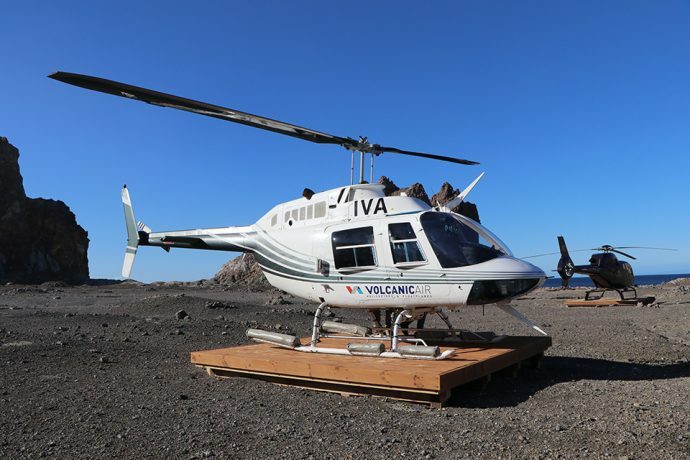 In addition to its main business of conducting air safaris, Volcanic Air offers rotorcraft and seaplane training, from type ratings and additional endorsements to biennial flight reviews.